Model-driven apps run with the new Unified Interface client which provides a responsive accessible design running in browsers and on popular mobile devices. This app type composes multiple component types including dashboards, forms, views, charts, and business processes which together form a great UI. 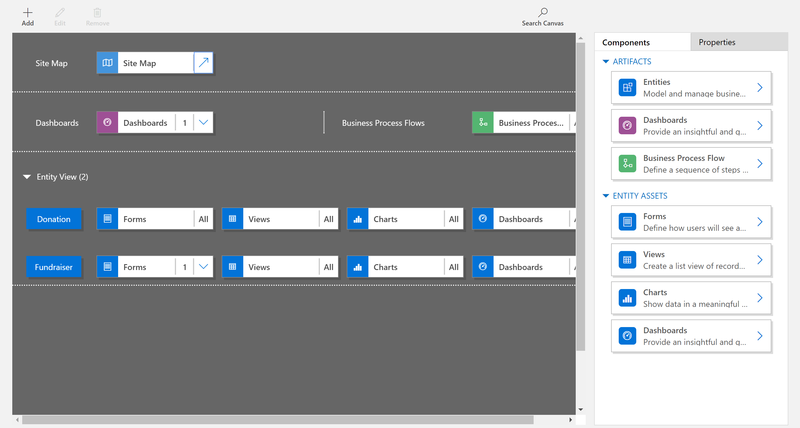 If you are familiar with the Dynamics 365 platform, you are already familiar with the PowerApps platform and Model-driven Apps. Both model-driven and canvas apps allow you to easily build business apps. They both share access to the Common Data Service providing standard and custom entities. Canvas apps start with your user experience, crafting a highly tailored interface with the power of a blank canvas and connecting it to 200 data sources. Canvas apps can be built for web, mobile, and tablet applications. Model-driven apps start with your data model – building up from the shape of your core business data and processes in the Common Data Service to model forms, views, and other components. Model-driven apps automatically generate great UI that is responsive across devices. Model-driven apps are built and managed from the PowerApps Portal similar to how canvas apps are built and managed. We have added a mode switch to the lower left corner which allows switching between the canvas and model-driven design modes. 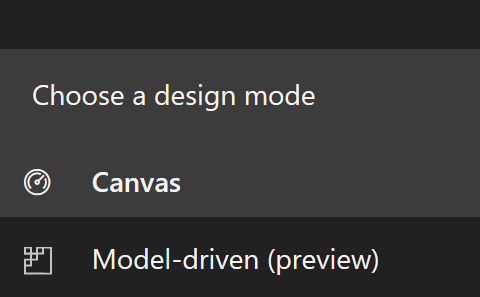 To change the design mode, click on "Canvas" in the lower left of PowerApps Portal to expand the switcher, then click on "Model-driven". The model-driven mode presents a navigation pane with content relevant to model-driven apps. The Home tab includes links to key items around modeling data, creating business processes, and creating an app. When a PowerApps trial environment is created, the environment includes three sample apps. The Fundraiser, Innovation Challenge, and Asset Checkout samples highlight key features within model-driven apps. The model-driven mode's Apps list contains all of the model-driven apps available in your environment. Creating or editing a model-driven app will open the App Designer which allows defining a navigation in a site map, dashboards, business processes, forms, and views. To learn more about creating model-driven apps, you can start with Overview of building a model-driven app. The model-driven mode shares the entity editing and management with the canvas mode. To learn more about entities, see Common Data Service. 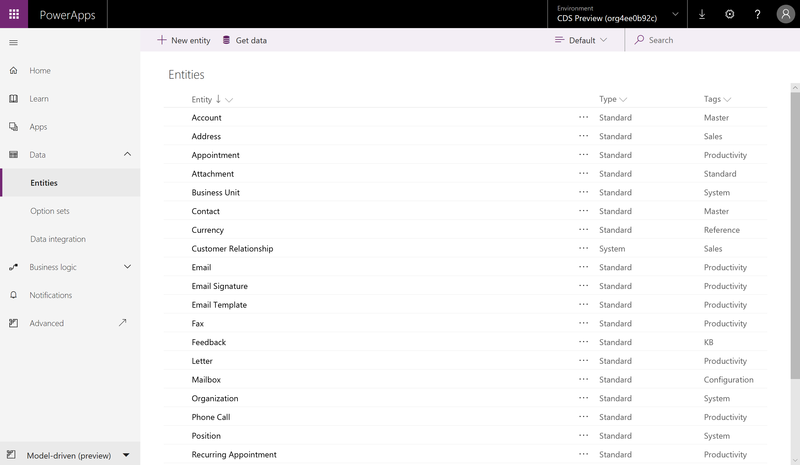 We plan to add more key components of a model-driven app directly within the PowerApps Portal. Some are already available through the App Designer or under the Entities. For those not directly available or more advanced customization, the "Advanced" button opens the Solution Explorer which contains the full set of model-driven artifacts and designers. 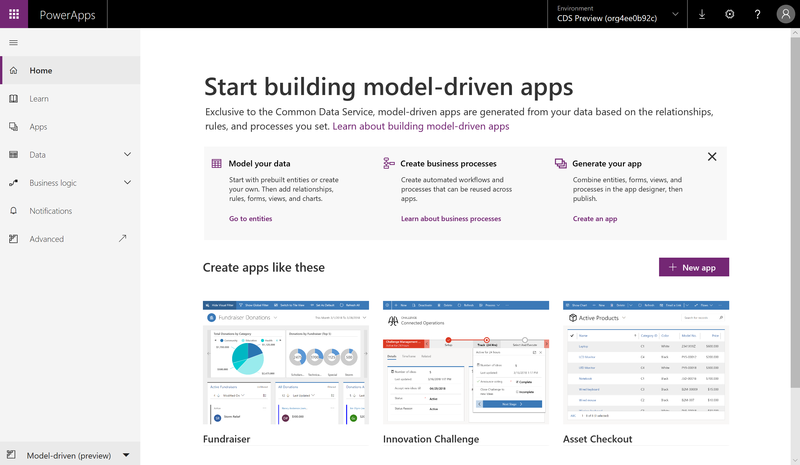 Try building a Model-driven App now by visiting web.powerapps.com. Model-driven Apps are available only with the new version of Common Data Service. If you haven't created one, create the latest version of Common Data Service database. 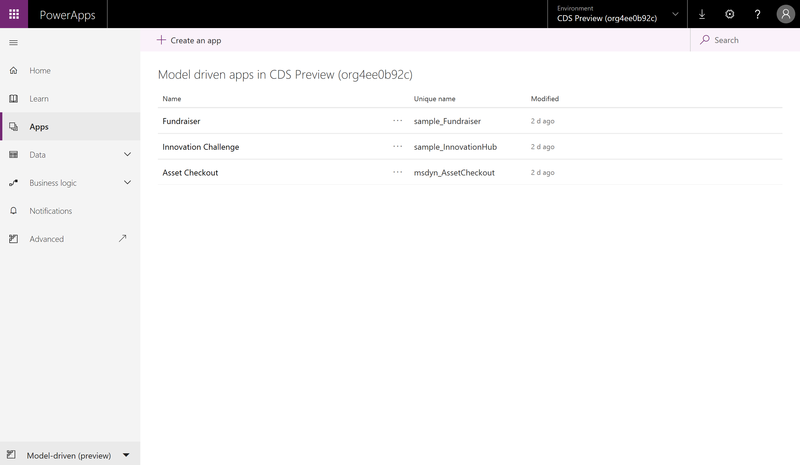 Provide us feedback at PowerApps community under the tag with "Model Driven Apps".